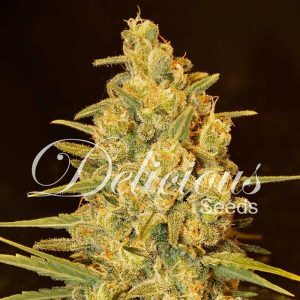 The most popular clone-only strain in the UK is now available in seed form. The growers who liked the Cheese will love the Exodus Cheese. 8 weeks flowering time indoors, with a production up to 800 grams per square meter (under 1000 Watt of light per square meter). Outdoors it finishes by end September, and can produce up to 800 grams per plant (with very large plants). It grows with a very branchy attitude, and good lateral development. It can use support for the branches during flowering. The effect is very stoned, effective medicinally against insomnia and pain. It has a very earthy, mossy flavor, with woody notes. Plant advised for growers with some previous grow-experience.